2019 Apple Festivals in Oregon - Where, When and More to Find an Apple Festival Near You! Looking for a apple festival in Oregon in 2019? (just scroll down the page)There is no other listing as complete and current as this list, just updated! All the apple festivals in Oregon we can find are listed on this page! If you love strawberries, look for a festival near you below! And I'm always looking for more apple festivals! Please write me, if you know of any to add! I update the dates as soon as the festivals publish their information, but you can always click on the links (usually the name of the festival) to see the current information on the festival's own website. 22801 SW Scholls Ferry Road, Hillsboro, Oregon 97123. Phone: 503-628-2775. We will have Good Old Country Music, Face painting, Hay Rides and other activities to help raise funds for the Aloha and Southridge High School Ski Teams. Make sure to mark your calendars for this annual event. Click here For Map Directions: Located 8 miles SW of Washington Square on Scholls Fry. Look for our big red barn & Oregon Heritage Farms sign! Molalla, OR. Phone: 503-829-6941. 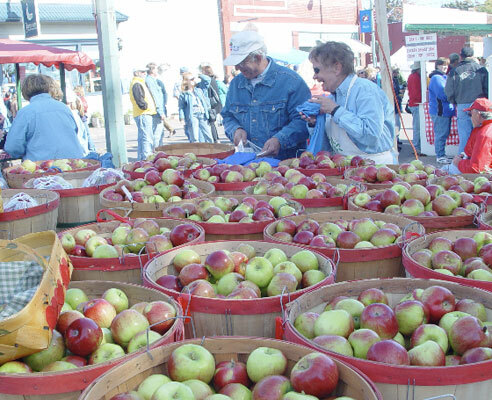 Apple Festival features exhibits, living demonstrations & apple treats. Annual Portland Nursery Apple Tasting Event - Second and third weekends in October: Friday, Saturday, Sunday, (see their website for dates!) from 10:00 a.m. - 5:00 p.m.
5050 SE Stark, Portland, OR 97215. Phone: 503-231-5050. Smith Berry Barn - Event dates: U Apple Festival mid October weekend, Pumpkin Patch and hayrides from mid October until October 31st. 24500 SW Scholls Ferry Road, Hillsboro, Oregon, 97123 Phone: 503-628-2172. Many other fruits, vegetables and nuts, honey, jam, hayrides, country store open daily thru Dec. 23, & more. Local crafts, antiques, gifts, and much more. We also feature herbs, perennials, and hanging baskets. March - Dec. 23, Monday to Saturday. 9 am to 7pm, Sunday 10am-5pm , Directions: Scholls Ferry Road. 10 miles SW of Washington Square in Scholls.